Sorry this item is temporarily unavailable. Have you ever listened to a bible study, and wished that it hadn't ended or you just can't wait to come back next week to dive into another chapter? Now we have a resource that is just for you! 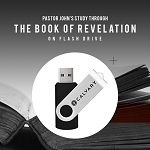 Introducing the Calvary flash drive filled with over 500 messages derived straight from God's Word. Now you can take the studies from Pastor John Randall anywhere with you on a convenient reusable 16GB USB flash drive. Copyright Calvary Store. All Rights Reserved. eCommerce Software by 3dcart.